Together as NKDX, Nick Kuceli and Daniel Stewart are impressing upon the world the occulted artefacts of the collaborative pact they've arrived at behind closed doors. With a vulturous gait and a pillow talker's touch, it's a tense dream that's being communicated. 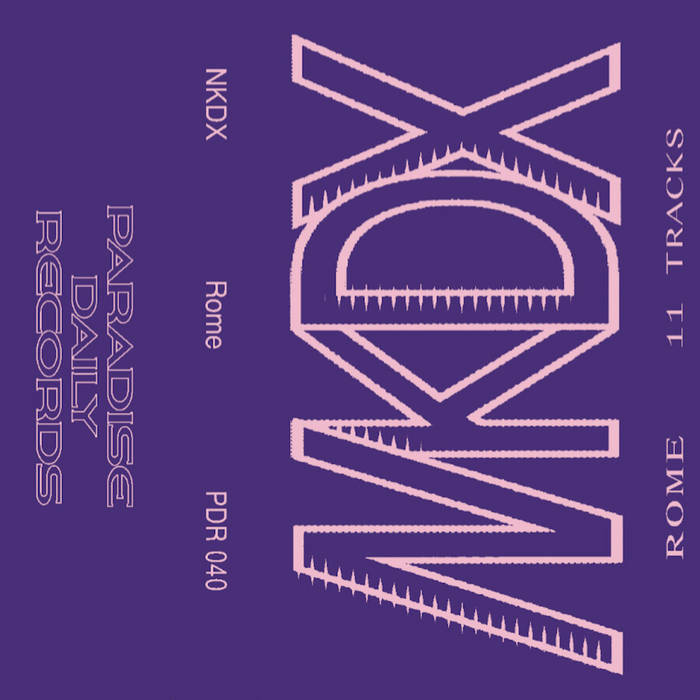 Gristly electronics deftly tease and structure the pharmaceutical noir being peddled on this, their debut release, Rome. Punctuated by field recordings and cooked and screwed tape manipulation, Kuceli's solo work as Gaud can be sensed in the foundations here. Paired with the attitudes of time-worn mania—which may be familiar from the wry technics of Stewart's raptured grimaces for Total Control—the haze of NKDX starts to condense and peak, finding a unique foothold. And all the while conspicuous fragments of frayed pop snag bluntly on the interior of their cosmos, letting out the air, letting in the catastrophe—or does that go the other way around? Paradise Daily.